Other names: Sticky Bob (North West England), Fox's Clote, Thorny Burr, Beggar's Buttons, Cockle Buttons, Love Leaves, Happy Major, Clot-Bur. 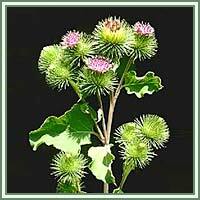 Habitat: Burdock is native to Europe. Highly adaptable, it can be found in fields, pastures and along roadsides, on recently disturbed soils. Seeds are brownish-green and wrinkled. Description: Biennial plant, grows up to 2 meters in height. It has a single stem divided at the top, and large, dark-green leaves. Leaves are coarse, ovate, emerging in a rosette from a long, tappering root. Lower ones are usually heart-shaped. Flowers appear on the second year, in July. They are purple, rounded with hooked spines. Parts used: The dried root from plants of the first year's growth, leaves, fruits, seeds. Useful components: Inulin, mucilage, carbohydrate sucrose, starch, volatile oils, tannic acid. Medicinal use: Traditionally, Burdock has been used for all sorts of ailments. Folk medicine considered Burdock to be an excellent “blood purifier”, diuretic and diaphoretic. It was also used for treatment of various skin conditions like acne, psoriasis, eczema. Burdock’s diuretic and diaphoretic properties are very helpful to people with uro-genital problems. Burdock root extract also shows mild antibiotic and cholagogic properties. It has strong detoxification abilities and a mild laxative action, therefore being helpful in treatments of flatulence and indigestion. Burdock seeds in forms of tea can be used in treatment of sore throat, tonsillitis, colds and coughs. Burdock root oil extract (Bur oil) is used for scalp conditions (dandruff and hair loss). It improves hair strength, recovering its vitality and shine. Modern studies have shown that Burdock root oil extract is rich in phytosterols and essential fatty acids, required for promotion of hair growth. 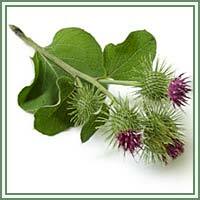 Safety: Pregnant or nursing women should avoid burdock. People who are dehydrated should not take Burdock because the herb's diuretic effects may make dehydration worse. Sometimes Burdock could cause allergic reactions. Some herbs could react with certain medication. Therefore, it is advisable to consult your doctor before consumption of any herb.